When it comes to producing specialty chemicals,luxury alcoholic beverages or essences,transmitting measured values in a high resolution and with no loss of accuracy ultimately means higher quality and yield. What’s more, the accuracy of the measured value is checked immediately. End-to-end digital communication via a bus system is clearly the way forward. For process engineering plants, there is a wide range of measurement technology and actuators available on the market that draw on PROFIBUS PA. This connection is used for both communication purposes and to provide the power supply. PROFIBUS PA allows long cable runs of up to 1900 meters and is easy to implement, even in hazardous areas. It is for this reason that many users are turning to PROFIBUS PA for digital communication. PROFINET technology is gaining ground at a control technology level and is increasingly replacing PROFIBUS DP. While the similarity of the PROFIBUS DP and PA protocols enables a transparent coupling that is imperceptible for the operator and engineering, PROFINET offers standardized integration for any protocol through its proxy technology. This key technology defines and standardizes the transfer of control and measurement data, as well as status, configuration and diagnostics. Operators who already rely on end-to-end digital communication are therefore ideally equipped for future developments with a combination of PROFIBUS PA and PROFINET technology. The PROFINET gateway for the new generation of the Power Hub series makes this proxy available and provides users with the ideal setup for tackling future requirements. This gateway supports line redundancy and the S2 system redundancy of PROFINET. Line redundancy refers to the installation and allows separate, redundant wiring. S2 redundancy connects a gateway to two separate masters via separate communication paths, allowing a high-availability system to be implemented. The extremely space-saving design of the individual components combined with the most compact fieldbus power supply on the market is allowing the Power Hub to set new benchmarks. The saved space means that significantly fewer switch cabinets are needed. The heat output is also very low, meaning active air conditioning is not necessary in our parts of the world. The low heat output also has a positive impact on the system’s energy performance and on availability. The Power Hubs can also be used in an existing system environment with PROFIBUS DP. Converting to PROFINET at a later stage by replacing modules is a straightforward process. This provides optimum protection for existing investments. Using PROFINET means choosing forwardlooking technology. However, at the current stage of development, there are still functions that PROFINET does not yet offer; functions that have long been a matter of course with PROFIBUS DP and PA. One important factor for safe and convenient operation of a plant is the traffic-light signal system in accordance with NAMUR recommendation NE 107. The fail-safe status is also crucial. This status ensures that, if communication should happen to fail, field devices such as valves adopt a status that was specified in advance. In the past, if operators wanted to use PROFINET, these functions required time-consuming manual programming. For this reason, Pepperl+Fuchs has collaborated with Siemens to develop a driver library. This driver ensures that these vital functions are automatically provided. It also enables the gateway and Power Hub to connect to the PCS7 control system via PROFINET in a simple process. The driver library automatically organizes all process data, status data, and diagnostic data for the PROFIBUS PA instruments in PCS7. The processes for configuring and diagnosing the gateway itself are also much simpler. This development means that manual configuration is no longer necessary, which saves time and engineering resources. As well as being tested and approved by Siemens, users also receive professional support for the new driver through their hotline. With PROFIBUS and PROFINET, the discrete sensors and actuators of the bottling plant complete with lines or robotics, for example, use the same infrastructure as the process components. This is where the clever combination shows its major advantage, because in this way the manufacturing and process signals can be transmitted to the control technology via a common, integrated system. This makes things much simpler for the operator when it comes to handling the system. Use of the technology is also appealing during system expansions or modernization, particularly among mid-sized clients. If PROFINET is already used for manufacturing processes elsewhere in the plant, the required process variables can be easily connected via PROFIBUS PA and the Power Hub. Adopting this setup makes it possible to use the same digital communication and avoid the need for an additional remote I/O system. Industrial service providers can also offer the operators expanded or additional services. The plant builder/system integrator can be given access to detailed diagnostic data, for example, via remote access or via Industry 4.0 applications in the future, enabling predictive, demand-oriented maintenance at optimized costs. The operator benefits from quiet and highly available systems. In addition, concepts for predictive maintenance already include more than just diagnostic data, so conclusions can be drawn about the field devices themselves. For example, if the pressure before and after a heat exchanger is recorded, this also enables conclusions to be drawn about the operation and condition of this device, even though the device cannot provide any diagnostic data itself. In this way, using PROFIBUS PA and PROFINET technology supports concepts that ensure a plant always runs at the optimum working point. Overall, the combined use of PROFIBUS PA and PROFINET technology equips manufacturing and process plants for the future, since end-to-end digital communication is the only option that enables optimum use of comprehensive diagnostic data from the field. 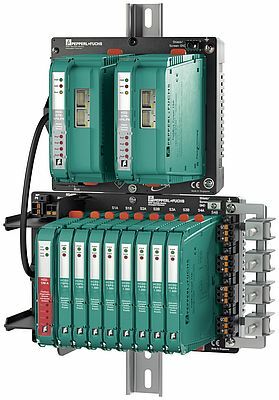 The PROFINET gateway from Pepperl+Fuchs together with the driver library mean that crucial functions for ensuring safe operation are now available without the need for manual programming.